Carved out by glacial floodwater of the Ohio River, the Cache River State Natural Area in Southern Illinois meanders a path that encompasses 1,000 year-old cypress trees and vast wetlands. It’s not only a place of beauty, it’s an outdoor haven for fishing, hiking, biking, and canoeing. The area is just south of Cobden, where you’ll find a great overnight stop at the Boars Nest B&B. Cache River State Natural Area is comprised of nearly 15,000 acres in three counties (Johnson, Massac, and Pulaski) and is home to a large diversity of plant and animal species. A great first stop for anyone visiting the area is the Barkhausen-Cache River Wetlands Center. Owned and managed by the Illinois Department of Natural Resources, the 7,000 square-foot center has interpretive exhibits, an informative movie, and a wealth of information on the natural and cultural history of this setting. The center is also a jumping off point for the popular Tunnel State Trail. Hikers will find more than 18 miles of designated trails within the Cache River State Natural Area. Treks through the wilderness will uncover all sorts of natural beauty, including the aforementioned cypress trees, whose massive bases—called buttresses—can exceed 40 feet in circumference. And be sure to listen for the bird-like songs of the tree frogs that live along here. The Lower Cache River Trail offers prime canoeing, with a three- to six-mile trail that passes through an enchanting cypress-tupelo swamp. Open Wednesday – Sunday, 9:00 a.m. – 4:00 p.m. 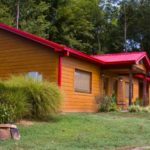 Heading northwest, Boar’s Nest Bed & Breakfast is about a 30-minute drive from the center. Set in among the trees, its five cabins have queen beds, full kitchenettes, and private baths. Four of them share a private deck and 8-person hot tub. The more-secluded honeymoon cabin has a Jacuzzi and private deck. Boar’s Nest B&B is a member of the Illinois Bed and Breakfast Association…a unique lodging experience! 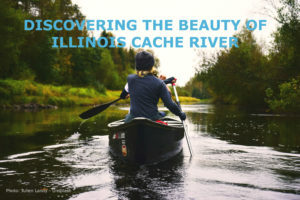 This entry was posted in Canoeing & kayaking, Hiking, Illinois Bed and Breakfasts, Outdoor activities and tagged Biking in Illinois, Cabins, Illinois Bed & Breakfasts, Illinois Travel, outdoor activities, Southern Illinois by admin. Bookmark the permalink.